Bureau Veritas Certification Holding SAS certifies that the management system of the above organization has been audited and found to be in accordance with the requirements of the management system standards and scope of supply detailed below. The Office of Defense Trade Controls Compliance received your registration statement and fee to register as a manufacturer and exporter. We have reviewed your registration statement and your registration code is M18389, which expires on 03/31/2020. Rex Heat Treat is ITAR approved and has and will comply with all required regulations. Since we only provide a service for our customer’s parts it is critical that our customer notify us on all paper work including request for quotation, either hard copy or digital, if the parts being quoted or sent to us must meet the ITAR requirements. Access to these documents will then be under plant manager’s control to assure only person(s) under ITAR regulations have access to any ITAR part(s) information. 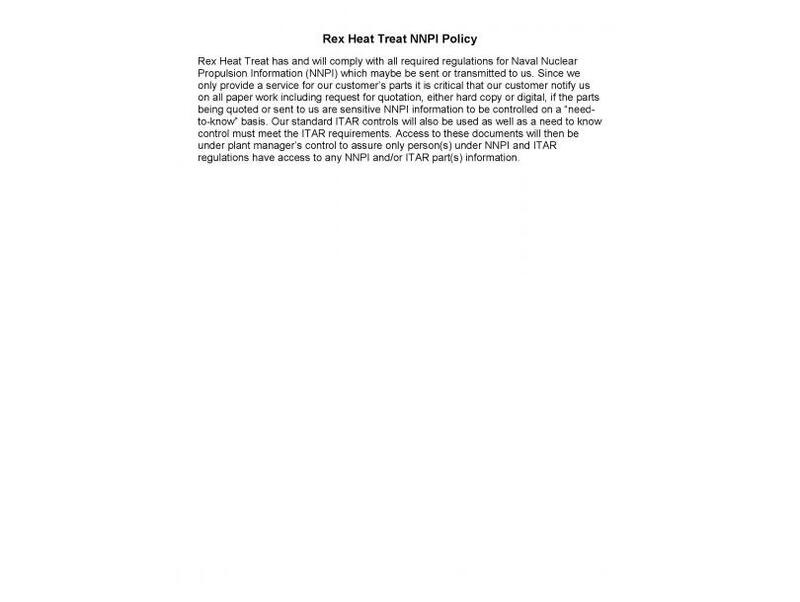 Rex Heat Treat has and will comply with all required regulations for Naval Nuclear Propulsion Information (NNPI) which maybe be sent or transmitted to us. Since we only provide a service for our customer’s parts it is critical that our customer notify us on all paper work including request for quotation, either hard copy or digital, if the parts being quoted or sent to us are sensitive NNPI information to be controlled on a “need-to-know” basis. Our standard ITAR controls will also be used as well as a need to know control must meet the ITAR requirements. Access to these documents will then be under plant manager’s control to assure only person(s) under NNPI and ITAR regulations have access to any NNPI and/or ITAR part(s) information.